Jan. 8, 2019 — LG Electronics (LG) President and CTO Dr. I.P. Park outlined the company’s vision for the future in his CES 2019 keynote, titled AI for an Even Better Life, on January 7 at the MGM Park Theater in Las Vegas, Nevada, USA. At CES, the world’s premier consumer electronics show, LG’s CTO outlined how the three key pillars of artificial intelligence – Evolve, Connect and Open – could deliver a robust AI ecosystem with diverse solutions for the real world. A leading proponent of consumer-focused AI technology, LG has continued to take a leadership role in advocating the beneficial role of AI in consumers’ lives. The keynote featured LG’s AI technologies implemented in daily-life scenarios to give the audience of more than 3,000 industry figures, influencers and journalists a better understanding of how the company is working on transforming tomorrow. 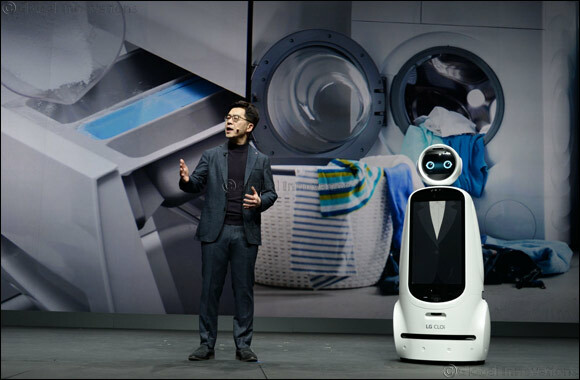 The LG CLOi GuideBot shared the spotlight with Dr. Park during the address, becoming the first ever robot to help deliver a CES keynote in the process. Since its launch in 2017, the company’s AI brand LG ThinQ has seen its portfolio grow rapidly to include air conditioners, washing machines, TVs, smartphones and robot vacuum cleaners. Dr. Park presented LG’s latest innovations in these appliances which leveraged the power of AI: the world’s most advanced AI chip for home appliances, a washing machine with reinforced learning, and “self-healing” machines that can detect and fix malfunctions automatically without interrupting operation. Dr. Park highlighted the importance of evolving intelligence in consumer electronics. For AI devices to go beyond simple voice recognition and automated task execution, they must be able to understand the purpose and intention behind each command. Such contextual understanding requires AI to evolve through accumulating interaction with the user. LG is also extending its unparalleled consumer insight from home to the road with its innovative offerings for a new in-car experience. In the advent of an autonomous driving revolution, LG has set out to change and expand the very definition of vehicles from a means of transport to mobile space. LG’s AI-enabled cabin solution will help users make the fullest use of their time saved from not driving, turning their vehicles into a conference room, movie theater or even personal shopping boutique. “Building this new in-car experience requires a wide range of different solutions in both hardware and software… which is why we need OPEN collaboration.” said Dr. Park, illustrating LG’s continued efforts to facilitate a culture of open innovation. He introduced LG’s collaboration with the leading seat manufacturer Adient to develop smart seats for a more personalized in-car experience. Also announced was LG’s new plan for its operating platform webOS which has been open sourced since March 2018. “From this year, we’ll be adding to webOS open access to LG’s proprietary AI platform for developers all around the world.” said Dr. Park. Dr. Park then presented LG’s ambition to unlock the potential of AI technology a much larger scale by connecting hitherto individual units into intelligent systems. LG’s Robot Service Delivery Platform (RSDP) will systematically coordinate what multiple robots see, hear and learn to transform how we manage our work and our environment. AI-based smart grid will allow us to radically improve the efficiency of our energy ecosystem, from production and storage to consumption. Intelligent signage will turn the physical elements of space such as walls, signboards and even floors, into an active, intelligent part of environment. LG’s keynote featured global experts including founder of the XPRIZE Foundation Dr. Peter Diamandis, renowned AI researcher Dr. Andrew Ng, managing director of automotive at Luxoft Alwin Bakkenes, senior vice president of engineering at Qualcomm Durga Malladi and director of the Contextual Robotics Institute at University of California San Diego Professor Henrik Christensen. Visitors to the LG ThinQ Zone in booth #11100 of the Las Vegas Convention Center this week will be able to experience LG’s collaborative technology and evolving AI firsthand.